Mooncakes are EVERYWHERE. Somehow the main celebration for the MId-Autumn Festival this weekend in China is centered on a not-so-tasty pastry. The hell with the mooncakes!!! Thom and I have decided to celebrate this holiday by going to Vietnam instead of eating pasty carbs but, hey, we’re rebels. What can I say-Ho Chi MInh City, baby, here we come! But back to mooncakes–the front page of the Shanghai Daily featured a huge picture of long lines of people lined up outside waiting to buy popular mooncakes at a bakery. Monday, I got my first mooncake gift from a co-worker. The beautiful tin box featured a rabbit motif. After I consulted Wiki, I know understand that rabbits represent the moon so that makes more sense. I cut open the really heavy small cake (4 to a box and they weigh a ton!) and saw the inner burst of color. I tasted that part first but it was really flavorless–Wiki says it is probably an egg yolk, maybe duck egg, symbolizing the full moon. Thom, James and I all participated in mooncake tasting together. Since each cake has 1,000 calories, I’m glad I only had one bite or I’d be at the gym all week working off the damn mooncake flab. It tasted like mild peanut butter but maybe that is what lotus seed paste tastes like. I have nothing to compare it to yet. I do know that despite complaints that mooncake sales are down dramatically due to controls on government bribes, the lines are still pretty long at all bakeries so I’m not sure that strategy is working for them. Even Starbucks sells them–always in gift boxes as they are presents to bestow on people you want to gain weight quickly. So, happy Mid-Autumn Festival everyone. Lots of stories to come this weekend from Vietnam. Scooters galore! Mooncake (simplified Chinese: 月饼; traditional Chinese: 月餅; pinyin: yuè bĭng) is a Chinese bakery product traditionally eaten during the Mid-Autumn Festival (Zhongqiujie). The festival is for lunar worship and moon watching, when mooncakes are regarded as an indispensable delicacy. Mooncakes are offered between friends or on family gatherings while celebrating the festival. The Mid-Autumn Festival is one of the four most important Chinese festivals. Typical mooncakes are round pastries, measuring about 10 cm in diameter and 3–4 cm thick. 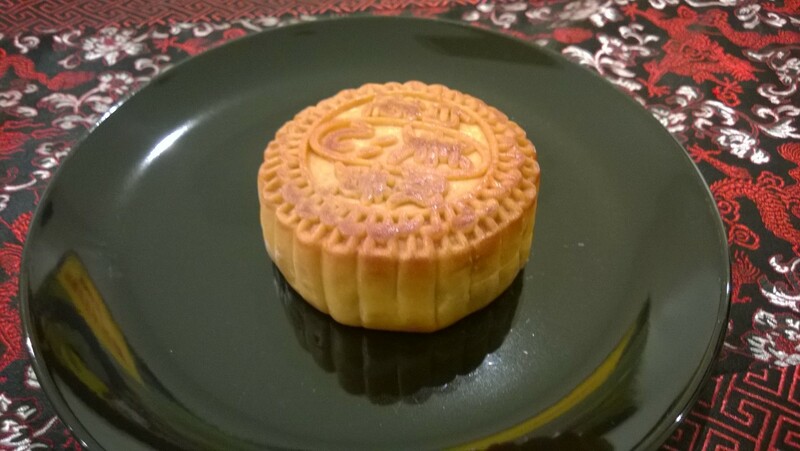 This is the Cantonese mooncake, eaten in Southern China in Guangdong, Hong Kong, and Macau. A rich thick filling usually made from red bean or lotus seed paste is surrounded by a thin (2–3 mm) crust and may contain yolks from salted duck eggs. Mooncakes are usually eaten in small wedges accompanied by Chinese tea. Today, it is customary for businessmen and families to present them to their clients or relatives as presents, helping to fuel a demand for high-end mooncake styles. 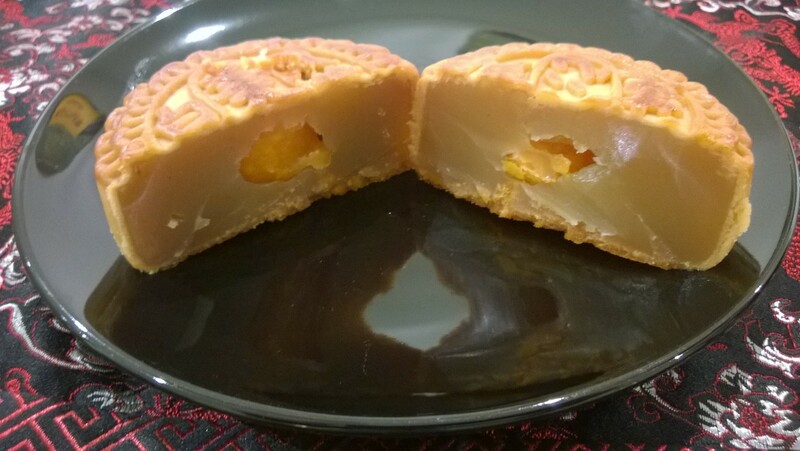 The energy content of a mooncake is approximately 1,000 calories or 4,200 kilojoules (for a cake measuring 10 cm (3.9 in)), but energy content varies with filling and size. Traditional mooncakes have an imprint on top consisting of the Chinese characters for “longevity” or “harmony”, as well as the name of the bakery and the filling inside. Imprints of the moon, the Lady Chang’e on the moon, flowers, vines, or a rabbit (symbol of the moon) may surround the characters for additional decoration.